By stacking and connecting layers of stretchable circuits on top of one another, engineers have developed an approach to build soft, pliable "3D stretchable electronics" that can pack a lot of functions while staying thin and small in size. The work is published in the Aug. 13 issue of Nature Electronics. To take stretchable electronics to the next level, Xu and his colleagues are building upwards rather than outwards. 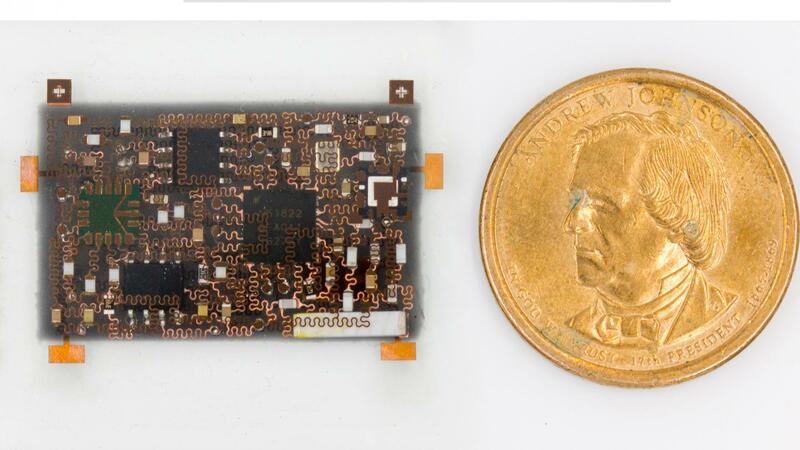 "Rigid electronics can offer a lot of functionality on a small footprint–they can easily be manufactured with as many as 50 layers of circuits that are all intricately connected, with a lot of chips and components packed densely inside. Our goal is to achieve that with stretchable electronics," said Xu. And the researchers did not sacrifice quality for quantity. "This device is like a 'master of all trades.' We picked high quality, robust subcomponents–the best strain sensor we could find on the market, the most sensitive accelerometer, the most reliable ECG sensor, high quality Bluetooth, etc.–and developed a clever way to integrate all these into one stretchable device," added co-first author Yang Li, a nanoengineering graduate student at UC San Diego in Xu's research group. Paper title: "Three-Dimensional Integrated Stretchable Electronics." Co-authors include joint co-first authors Zhenlong Huang, Yifei Hao and Yang Li, Hongjie Hu, Chonghe Wang, Akihiro Nomoto, Yue Gu, Yimu Chen, Tianjiao Zhang, Weixin Li, Yusheng Lei, NamHeon Kim, Chunfeng Wang, Lin Zhang, Ayden Maralani, Xiaoshi Li and Albert Pisano, UC San Diego; Taisong Pan and Yuan Lin, University of Electronic Science and Technology of China; Jeremy W. Ward and Michael F. Durstock, The Air Force Research Laboratory, Wright-Patterson Air Force Base.